This day was all good weather, Bakerbots Baking was one of the first Ice Cream stores that I hit up once the sun came out to play. 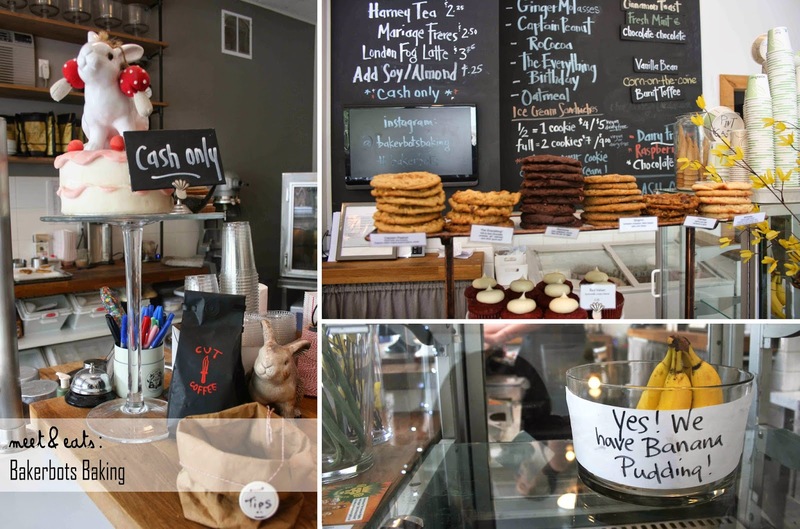 Bakerbots is located a very short walking distance from Ossington Station, just off Ossington Avenue. They cater their baked goods, most days after 3PM. I went with two of my good mates, and I happily introduced an Ice Cream Sandwich to them. We made our visit on a Wednesday afternoon, and lucky for us, the single table that they had in the shop was just cleared. There is also bench seating outside, merry places to sit and chow as well. Although there is a short amount of pickings for pastries and other sweets (Macaroons, Cakes, Cupcakes..) on weekdays, we did not come here for either of those. The House-made Cookie ($1.50) options are plentiful, on the day I made my prance, there were Ginger Molasses, Captian Peanut, RoCocoa, The Everything, Birthday and Oatmeal. The Cookies make great pairings with their interesting assortments of rotating also, Homemade Ice Cream, these, being in Cinnamon Toast, Fresh Mint, Chocolate Chocolate, Vanilla Bean, Corn-on-the-cob and Burnt Toffee. 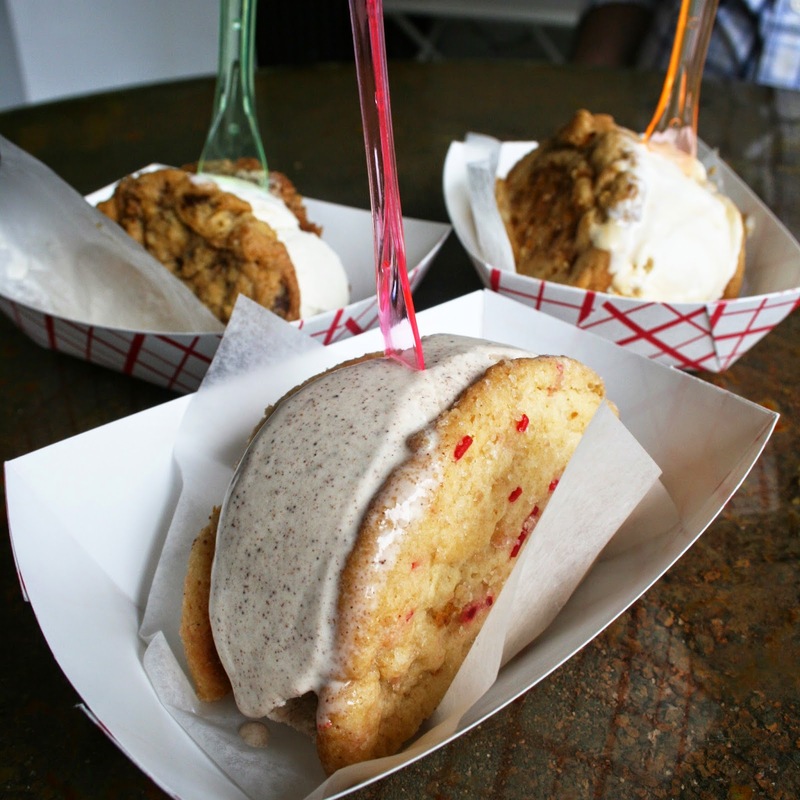 The Ice Cream Sandwiches come in half ($4) or full sizes ($7), as well as in Vegan and Dairy Free options. The Dairy-free Ice Creams are either the selection of Raspberry or Chocolate. Don’t forget to ask for pairing suggestions! These were exceptionally well-made cookies, eaten by itself, it was both crisp and chewy, but both of these traits would fade away once they were in contact with the cold ice-cream, hardening it. I would definitely like to enjoy these cookies individually, here, I was only able to truly appreciate the Ice Cream of each. My favourite Ice Cream of the three was the Cinnamon Toast! The Vanilla Bean was not much shanzzy, and the only fun bits in the Burnt Toffee were the bits of swirls in it. The Cinnamon Toast was incredible, it sure brought back childhood memories, Cinnamon Toast Cereal drenched in milk, also flavouring the milk to a very sweet, slight-cinnamon taste. Delicious! Everything is so well made! I’d like to try their cookies individually, another merry day. But lucky for me, I won’t have to make such an out-of-the-way trip, now that they have opened up another storefront by Ossington and Queen! You should definitely drop by if you’re by Ossington Station to try an Ice Cream Sandwich.